A former Gael linebacker has been “Bitten” by the acting bug. 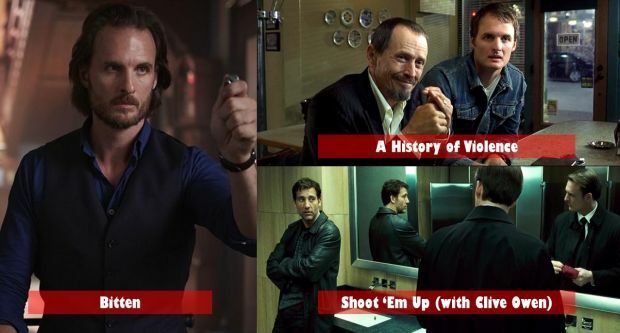 Greg Bryk, a 1994 Drama grad who helped Queen’s win the Vanier Cup in 1992, has made the switch from the gridiron to the stage having starred in more than 65 films and TV shows. He currently stars werewolf pack leader Jeremy Danvers in Bitten (which airs on Space Channel in Canada) and has also appeared in films such as Book of Negros, The Incredible Hulk, Saw V, Shoot ‘Em Up, and Men With Brooms. Queen’s had a big impact on his life. It is where he played sports, learned about acting and – most importantly – met his wife Danielle Bryk, Artsci’95. “We sat across the table from each other at the drama semi-formal in my third year, as other people’s dates,” recalls Bryk about the time he first met his wife. Question: You have starred in more than 65 TV shows and movies. What are the one or two roles that stand out for you? Answer: Men With Brooms was my first feature film and I remember walking on air on the day I was cast as Alexander (The Juggernaut) Yount opposite Paul Gross. Book Of Negroes was also special because of the brilliant book it was based on, working with director Clement Virgo (Poor Boy’s Game) again and the powerful experience of shooting in Africa. I often get asked to play complicated, difficult characters. Broken men who hurt others and often are hurting themselves. Beauty is rarely pretty and I prefer the honesty of playing the damaged struggling to become whole. The role that started this journey, my revealing the dark hearts of dangerous men, and the one that most obviously changed my career was Billy in A History of Violence. David Cronenberg had to fight to put me in the movie. Because the first seven minutes of the film follow my character, the studio wanted a recognizable Hollywood face in the part. David had watched my audition and insisted on casting me. Being in a film with Viggo Mortenson, Ed Harris, Maria Bello and William Hurt made a huge impression on me and they were incredibly supportive of my work. The movie was exceptional, with a Golden Globe nomination for Best Picture, and my part was memorable. My violence and vulnerability unsettled people. People still approach me to talk about the scene where I stare at the kids in the car. It scared them. We all have a capacity for great violence. I don’t blink when I look at mine. It launched my career playing monsters. The other role that has really changed me is Jeremy on Bitten. The demands of playing this wonderful leader challenged me to grow as a man. I was cast when I turned 40 and the natural accounting we go through while entering middle age inspired me to become a better father, husband and leader in the community. Responsibility is a duty, but at its best, it is an honour worn with grace. The role called for power and violence, but it finally allowed me to express great depths of love. Unfiltered and raw. It has allowed me to finally become the strong leading man that I always aspired to. Question: In Bitten, you play pack alpha Jeremy Danvers. Can you talk about how the role has changed you? You have said before the role has opened your eyes as you watch your character learn how to be a leader and how to deal with violence. Answer: Playing Jeremy has been one of the most rewarding experiences of my life. When I first started pursuing the part, I was going through a turbulent time. I was entering my forties and I was lost. I had been a father and a husband since I was in theatre school in my very early twenties. Life had just happened. I struggled and fought to make it work, but I didn’t know what type of man I really wanted to be, or how to become him once I figured that out. While searching for those answers in my own life, the role of Jeremy challenged me to ask the difficult questions that have helped me grow as a father, leader and a man. I take my work seriously. I took the responsibility of being a mentor for my younger cast mates as an honour. I started to consciously invent myself in the colours that Jeremy was painted in. I worked with an amazing counsellor. I began to teach acting to a brilliant group of at-risk young people in Toronto, trying to inspire, teach and really just love them. I committed myself to embody the ideals of this Alpha. Reaching for that, brought me closer to the best me. My life began to parallel Jeremy’s journey. We both struggled to protect our families through trials and tribulations, hellos and sad goodbyes. I think my work was richer because it became so deeply personal. You can’t fake love and I was blessed with a cast and crew that I was able to love and who showed me love in return. We all made each other better and in return I became a more fully realized man for my family and community. So rarely in life do we get the chance to change and become the person we really want to be. Jeremy was that chance to change. And I did and I will carry him with me as a guide for the rest of my life. Question: You played linebacker on Queen's 1992 Vanier Cup-winning football team. Is the teamwork on the field similar to the teamwork it takes to put a movie or TV show together? Answer: I was privileged to play linebacker on the Queen’s Golden Gaels football team during my first three years at the school, before I stopped to do Hamlet and pursue acting in my fourth year. Playing with that exceptional group of young men, and winning the Vanier Cup under the guidance and coaching of Doug Hargreaves, Bob Howes and Bob Mullin, taught me the road map for success. In order for a team to be great, everyone needs to play their role. Everyone needs to selflessly offer their gifts and talents to the endeavor and take nothing away from it. Not everyone is the star, but everyone must contribute the best they have. They need to figure out where they fit and leave their ego out of it. A film set, when it operates smoothly, runs on the same principle. Everyone has a job and everyone has to do it well. There are times when you need to be supportive and stand back, just as there are times when you take charge and lead. I am sensitive to that dynamic because I know it works. I trust the idea of a team and I commit to the idea fully. Question: Your wife is also a Queen's grad - HGTV host Danielle Bryk, Artsci'95. How did you two meet? Answer: We sat across the table from each other at the drama semi formal in my third year, as other people’s dates, but I couldn’t stop staring at her. Or thinking about her in the months afterwards. We finally met the next year working together at The Shot. I kissed her for the first time on the night I as was cast as Hamlet in the school production. Madness onstage and off followed suit. We fell desperately in love. I raced back and forth from rehearsal to her little room on the third floor of a house she shared on Aberdeen. In our first week together she bought a tiny pair of baby Levis at a vintage shop and smiled at me and I just smiled back. During Christmas of my fourth year we decided to move to New York together. We packed one little suitcase together with some clothes, some books and the tiny Levis. I went to Circle In The Square Theatre School and she studied at Parson’s School of Design, interned at the Richard Anderson art gallery and worked in a great little restaurant in the East Village near our 200 square foot apartment. In my second year of theatre school, we started to fill those baby jeans, having our first son, and getting married. Years and more babies and endless moves, with Danielle contracting and designing our houses out of financial necessity, led to a project called Building Bryks on the DIY and W networks. The show was a hit and Danielle launched her design firm while also starring in shows on the DIY network and HGTV. She is currently shooting A Home To Win for HGTV with co-stars Sarah Richardson, Bryan Baumler and Paul Lefrance. Question: You have just released a book of poetry, Other Rooms. When did your love of poetry start and how does it feel to share your poems publicly? Answer: I have always loved poetry and writing was my only creative outlet before I began acting as well. When I was cast as Jeremy in Bitten, we were encouraged to begin using Twitter. I loved the interaction with the fans and followers of the show and I began writing Twitter length poems to share with them. My followers responded enthusiastically and began asking for the poems to be collected in a book. This fall I put together Other Rooms, which is comprised of 275 poems and very short stories, impressions really. The work satisfies a deeply romantic and sensual streak I have. I have a hunger for a visceral connection in my art, the intimate dance with another actor, or the reader in this case. I crave that honesty. People sharing their deepest selves. Now the writing has fans outside of the Bitten community and I truly enjoy writing for them and having them experience the poetry in the fire of its creation. With Twitter, they get it the second it is written. It is a wonderfully vulnerable experience. Naked. So very, very naked.